Zimbabwe FA chairman Cuthbert Dube intends to push ahead with plans for the association to turn to farming to help fund its operations. Dube was re-elected at the weekend and has asked government to give Zifa several farms around the country. Zifa's debt grew to around US$6m in Dube's first four-year term, and he is thinking outside the box for solutions. "Maybe some people will ask if I'm still alright in my head, but we are going to diversify into farming in a very big way," said Dube. 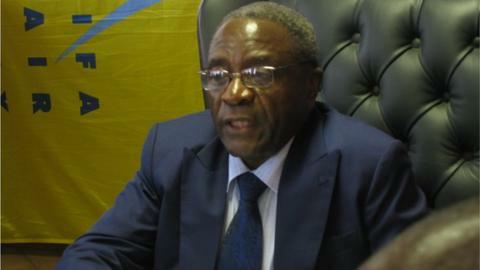 Zimbabwe FA chairman Cuthbert Dube insists he intends to push ahead with plans for the association to turn to farming to help fund its operations. "I've already started talking to the responsible government ministry, as we've got the land reform programme." Dube saw off three contenders to retain control of Zifa, but his victory has been unpopular with many football fans. The BBC's Steve Vickers assesses the Zimbabwe Football Association's plans to begin farming as a way of raising revenue. Zimbabwe has had little success over the past four years, with the exception of a fourth-place finish at this year's African Nations Championship finals. Zifa has struggled to fund the national men's and women's teams, and has not been able to offer senior men's coach Ian Gorowa a contract although he has been in the job for eight months. With Zimbabwe's economy shrinking, it is difficult for sports associations to find commercial sponsors, and Dube feels that it is time to try something new. "Let's not just depend on sponsors - some of those sponsors are also sinking financially," he said. "We are going to do cattle ranching and crop farming, and there's no way you can fail." Zimbabwe's government began a land reform programme in 2000, with government taking ownership of most of the country's white-owned farms and handing them over to black Zimbabweans on long-term leases.